We're taking a field trip to El Dorado Hills! Join us for a Happy Hour at Osteria Moto and hear story behind the design! Stephen Saklusky will share how his space was designed with light and materials that age well with time and work well with operations and flow. 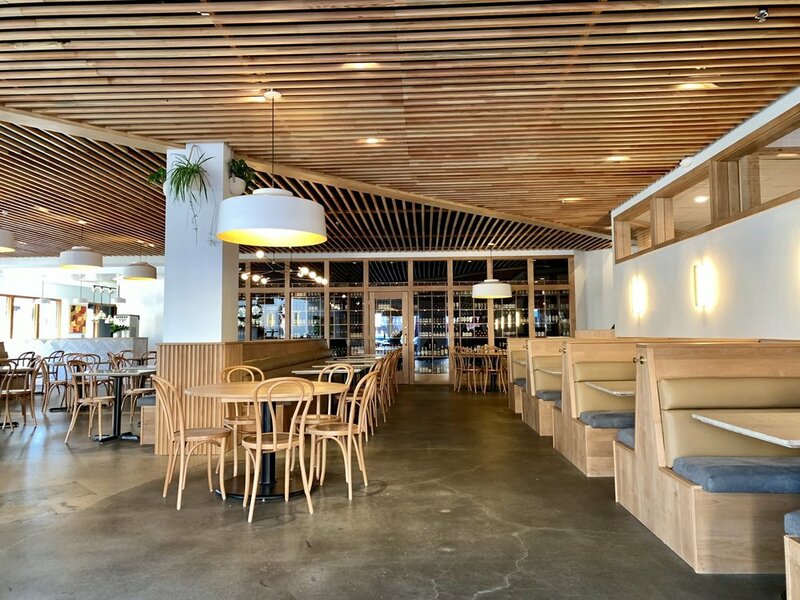 Read this article in California Home Design to see more beautiful images of the space by Nicolette Lovell and learn more about the restaurant. Stephen is the owner and brains of the renowned LA favorite, Osteria La Buca, a neighborhood institution in Los Angeles for over 10 years. Osteria la Buca is an airy and modern Italian tavern using fresh California ingredients from its own farm. Every detail is made with care down to their own handcrafted limoncello and music playlists. Stephen shaped the rustic chic spot into a perfectly humming ship with flawlessly running infrastructure, sophisticated proprietary systems and an incredibly loyal staff. Stephen is known for his devotion to his staff, which is evident as most have been with him since the day he opened his doors, notable in an industry known for its two-week turn over. He is an active mentor to his own young staff at both restaurants and to Loyola High School seniors where he went. Stephen cultivated his sharp eye and taste for cultures through his travels as a photojournalist capturing moments from Kashmir to Paris to Montana. Stephen is also the founder of Amaro Angeleno. America’s first true amaro of place. Stephen now resides in Northern California with his wife Christina and son Wallace. When he’s not running around at the restaurants, he’s on his dirt bike or catching up on reading. Andy Chavez was born and raised in Los Angeles, CA. He first got the “bug” for cooking as a child working with his grandmother from helping out in her backyard garden to butchering chickens from his grandfather’s chicken coop. He was just seventeen when he met his first mentor, Jason Travi of Superba Food & Bread. Andy’s first role in a professional kitchen was shucking oysters. Travi saw this simple task as a foundation for Andy, which led him to work one-on-one with Travi. As a result, Andy was given the opportunity to work events with James Beard award-winning chefs such as Michael Cimarusti and David Lefevre. After three years of working with Chef Travi, Andy felt it time to further is training in a new kitchen at Republique in Los Angeles. Republique’s Chef/Owner Walter Manzke showed Andy what it took to work with a big team and the reasonability’s of each cook and station. Shortly after Republique, Andy was given the opportunity to work at Osteria la Buca under Chef Cameron Slaugh (formerly of Eleven Madison Park). Rising to the rank of sous chef, Andy was challenged in his first leadership role at the age of only 21. While working at la Buca Andy started working with fresh products by growing and harvesting from la Buca’s own local farm. He also built great relationships with local farmers and to keep ingredients as fresh as possible and making as much as he could from scratch. In his second year at la Buca, Andy was promoted to chef de cuisine, therefore making him the leader of the kitchen and ears and eyes of Executive Chef Cameron Slaugh. From here, Andy has strived as a leader and is giving opportunities to new young staff to train and become chefs themselves. A Sacramento native and active contributor to the local arts community, Joshua unites his roots in graffiti with his keen eye for color and a love of the simplicities he finds in cubism to produce his body of work. Each piece is titled with the name of a song, connecting us to an additional important facet of inspiration for his process and another form of art he holds in high regard. The flow of the pieces he created for the Osteria Moto is meant to signify the transition from the outdoors and the natural world to the comfort and cohesiveness of the dining experience to the warmth of the kitchen. Joshua was raised in El Dorado County and attended Oakridge High School in El Dorado Hills. Thank you for having us, Osteria Moto!